Every vendor, in every city, in every region of India, offers their own version of Chai Masala, the aromatic, spiced, milky tea that has been the Indian drink of choice for hundreds of years. 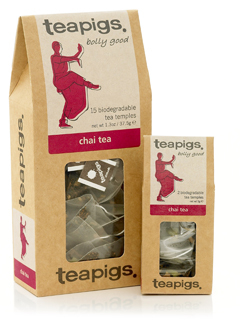 Here’s our version; a blended rich, malty Assam tea with cardamom pods, cinnamon, ginger and cassia. A satisfying, healthy drink that captures the vibrancy and colour of India in a cup. Compare the large leaf in our tea temples to the dust in your regular tea bag, whole leaf is best. A gutsy Assam tea and an exotic mix of whole spices for a true taste of India. With milk or even as a chai latte – a perfect warmer! Half asleep. This tea will boost the awake half, and give the sleepy half a resounding slap around the chops. Tea, cinnamon, ginger, cassia, cardamom pods, natural cinamon flavour, vanilla.